Ohio’s First District Court of Appeals heard arguments Wednesday in a case that has the potential to end Hamilton County’s controversial homeless camp ban. Hamilton County Common Pleas Court Judge Robert Ruehlman issued the ban in August. It prohibits outdoor homeless camps from public and private property throughout Hamilton County as long as local shelters have space to accommodate people experiencing homelessness. Proponents of the ban have argued that local homeless shelters have space, but many advocates for the homeless say the shelters are almost always over capacity. 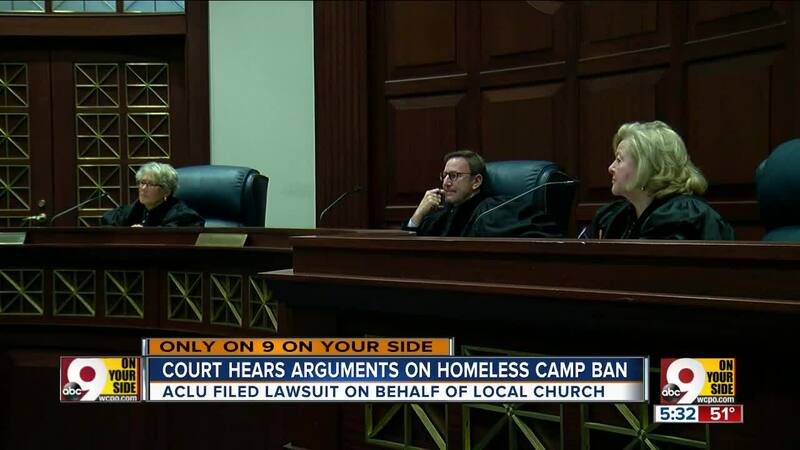 CINCINNATI — Ohio’s First District Court of Appeals heard arguments Wednesday in a case that has the potential to end Hamilton County’s controversial homeless camp ban. Hamilton County Common Pleas Court Judge Robert Ruehlman issued the ban in August. It prohibits outdoor homeless camps from public and private property throughout Hamilton County as long as local shelters have space to accommodate people experiencing homelessness. Proponents of the ban have argued that local homeless shelters have space, but many advocates for the homeless say the shelters are almost always over capacity. But Christian Schaefer, an assistant county prosecutor representing Ruehlman, argued the church has no standing in the case. Schaefer said the primary reason behind the ban was that the large homeless encampments in downtown Cincinnati last summer were posing threats to public health. RELATED: Six months after Cincinnati's tent city, what has changed? If the church were to allow homeless people to camp out on its property, Schaefer said, the church would be able to provide the running water and bathroom facilities necessary to prevent those public health problems. Mead also argued that the ban stemmed from an improper lawsuit that Hamilton County filed against the city of Cincinnati in an effort to help Cincinnati Mayor John Cranley disperse the camps. ACLU of Ohio Executive Director Ben Guess repeated that argument in an interview with WCPO after Wednesday’s proceedings. Schaefer said in court Wednesday that the county’s lawsuit against the city was necessary to force city officials to enforce their own policies. A majority of Cincinnati City Council didn’t want the city manager to enforce the city’s health and safety ordinances, and the county felt compelled to force action, he said. A separate lawsuit related to the homeless camps is working its way through federal court. Bennett Allen is the lawyer representing Joseph Phillips, Patrick Chin and the Greater Cincinnati Homeless Coalition. The threat of arrest can put people’s jobs at risk, Allen said. If the ban stays in place, those threats remain very real, he said. “It gives a certain amount of authority for the state, in this case the city and the county, to act without honoring a citizen’s right to due process,” Allen said. If New Prospect Baptist Church were to allow people to set up four tents on church property, Allen argued the ban gives law enforcement officials the authority to go onto the campsite, arrest the people camping there and seize their property without a warrant and without any evidence that they were doing anything illegal. It could take several weeks or months before Judge Russell Mock, Judge Beth Myers and Judge Sylvia Hendon issue a written ruling in the New Prospect Baptist Church case.